Pages etc. : xvii+686p., (3)maps, (48)col. pls., (1)col. folded pl. (63.5X24cm), bib., indices, 24cm. 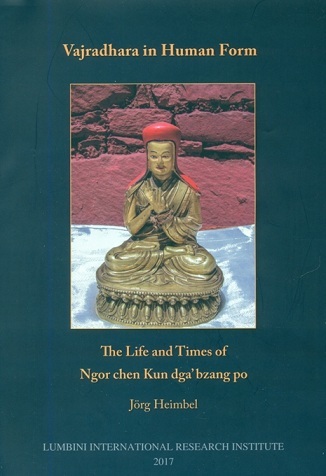 The present study is a revised version of author's dissertation, Ngorchen Kun dga' bzang po (1382-1456)--An Investigation into the Life and Times of the Founder of the Ngor Sub-school of the Sa skya Order, submitted at the University of Hamburg, Germany, in 2014. Ngorchen was one of the most outstanding and influential Sa skya masters of the fifteenth century who founded Ngor Monastery in 1429. This study contains six parts. Part One gives an overview of the research conducted previously on various aspects of Ngor chen's life and the history of Ngor and its tradition. Part Two introduces the primary sources for studying Ngor chen's life. Part Three and Part Four are devoted to the exploration of Ngorchen's life. Part Four explores major episodes from Ngor chen's life after having completed author's religious training. Part Five approaches Ngorchen's writings.